In early 2017, SiriusDecisions, the leading global b-to-b research and advisory firm, conducted an online survey of more than 300 b-to-b product managers worldwide to understand the current state of tools and technologies used by product managers, as well as the emerging class of solutions specifically designed for product management use. 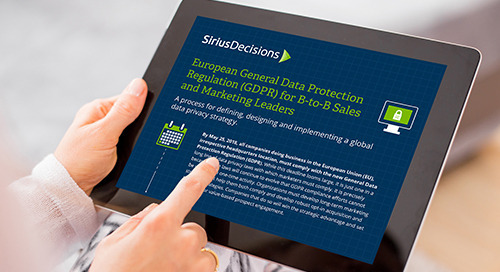 Define, design and implement a global data privacy strategy. 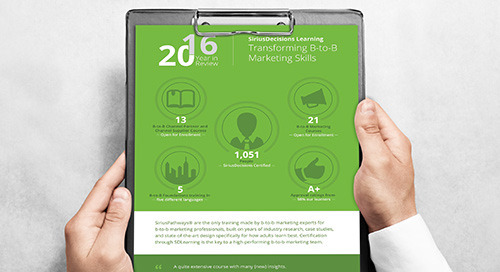 Elevate and upskill your b-to-b marketing team. When asked, here’s what CMOs had to say about enhancing their team's skills this year. What does your organization have planned? Gain clarity on the five areas of focus for sales operations leaders. Discover where to focus to make your number. Discover the key elements of an effective marketing competency assessment. Upskill your team to ensure success. Look into marketing operations' past and present to understand where it is heading in the future. Learn which key competencies customer marketing professionals need to drive success in today's b-to-b environment.